Most people assume that a guest-worthy Thanksgiving turkey relies on soaking it first in a salty brine or a salty rub. But here's a little secret: That's not true. There are actually many different ways to cook a tasty turkey, beyond the brine, that will leave the skin golden and the meat moist. So if you or a loved one are on a low-sodium diet this holiday season, don't settle for roast beef. 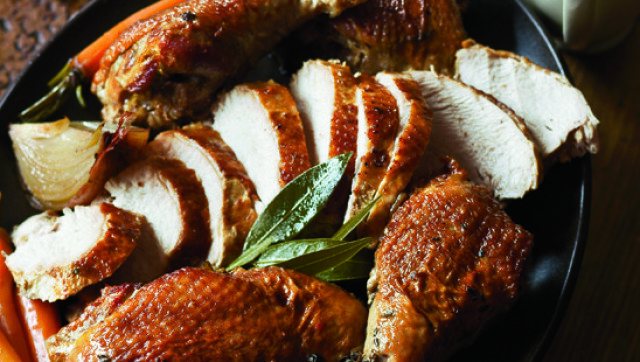 Instead, choose from the methods below to produce a seasoned and juicy turkey fit for any Thanksgiving feast. One you'll be proud to share with others. And remember, beyond all these tricks, the best way to overcome any salty dilemma is to be creative. Because when you have to lower the sodium, you have to kick things up with less traditional spices and techniques. Which will leave your guests pleasantly surprised and full. With or without the salt. Most recipes call for the turkey to be cooked breast side up. If you turn it to the other side, however, all those cooking juices will drip down around the breast meat, basically basting it for you. If you choose this method though, just know that your bird won't achieve that award-winning golden hue (unless you try and flip that eight-plus pounds of meat over again for the last fifteen minutes). But you also won't be stuck with tons of dried-out leftovers. Fact: All the parts of the turkey cook at different times and temperatures, which is why it is so darn difficult to keep the white and dark meat equally juicy. But if you don't mind skipping the big "carving moment," then break your bird into pieces before you put it into the oven, removing the breasts when they reach 145° and the legs and wings at 165°. Or spatchcock (or butterfly) the turkey by removing the backbone and flattening it on a large roasting pan or baking sheet. This will expose the wings and legs to more heat, helping them cook faster (so the white meat doesn't have to wait as long) and allowing the fat to drip off the bird, leaving the skin crispy. Because both methods reduce the risk of dry meat as well as the time needed to cook it, be sure to check the thigh meat temperature earlier than usual. Depending on the size, you might have that bird out of the oven in just a few hours. Harold McGee is a culinary genius and when it comes to Thanksgiving turkey, he offers a brilliant suggestion: Use ice packs. Yes, ice packs, to cool the breast meat before it cooks in the oven. While the legs and wings warm up, the breasts chill and lower in temperature by 10 to 20 degrees. Meaning that when you finally cook the turkey (without ice packs! ), they'll cook slower than the dark meat, avoiding overcooked white meat syndrome. Which is exactly what you want. Just because you can't use brine doesn't mean you can't use juicy liquids. Now that you have pockets between the skin and the meat, feel free to fill them with an oil or butter-based rub, a homemade marinade, or even slices of oranges. This will help keep the meat moist and flavorful as it cooks. And as the liquids collect at the bottom of the pan, put them to work. Use a ladle to bathe the bird in its juices about every 30 to 45 minutes. If you get a small enough turkey, you can use the ultimate method for golden poultry: beer cans. By sitting your mini turkey (or guinea hen or chicken) upright on a half-emptied can of beer (or soda, beans, or best yet, a ceramic turkey sitter), you'll continually release steam inside of the turkey, theoretically keeping the white meat juicy (although, it's been contended) and definitely making the skin super crispy. Just remember to make sure your bird is stable and to open and partially empty your beer can before you place the bird over it.